Dear Rhonda and Hanno ~ I am really sorry for your loss. Keep your sweet memories locked in your hearts. Your dinner looks delicious and it's always nice when we can make a delicious meal inexpensively. So sorry to hear about the sudden death of Hanno's sister, so far away in Germany. Never the same, always new and so very 'mommy's specialty'. I'm so sorry about the loss of Angelica. Your family is in my thoughts and prayers. Thank you for the recipes, it looks delicious. Enjoy your afternoon with Jamie. Hi Rhonda! I am so sorry for Hanno & your loss - it must be terribly hard, especially when you are so far away. My thoughts are with you both and the rest of your family! The dish you described is a great one - I am originally from a small town just north of Hamburg (it's called Flensburg) and having Frikadellen & Gurkensalat (cucumber salad) is very popular. My mum - like you - always makes the meatballs from a mix of pork & beef mince - they stay nice and soft that way (just like yours look...yummy). So very sorry to hear about Hanno's sister. My thoughts are with you and your family. That meal looks so good Rhonda...YUM! Condolences on the loss of your sister-in-law - those family connections grow even more precious as the years pass. And thank you for the recipes - frikadelle are a specialty of a German deli close by, and I've often thought it would be possible to make them myself. And the salad looks to be a perfect match. Mine is not a meatball recipe but a comment on the cucumber. We have an abundance of cucumbers (yet again) so I make this salad for my lunch. 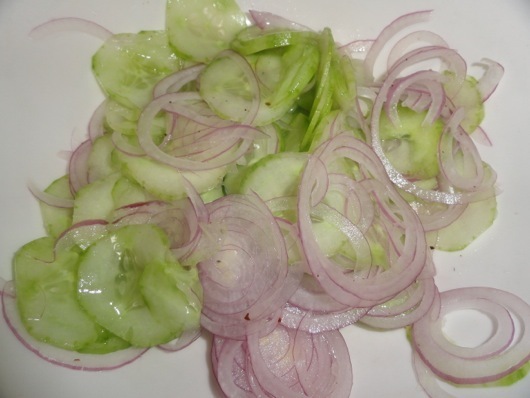 Peel and slice a cucumber, finely slice some onion. 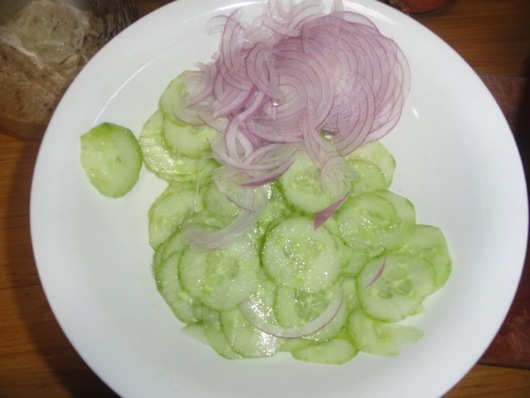 Layer the cucumber and onion rings on a plate, sprinkling each layer with a tiny amount of good quality sea salt. Allow to stand for 30 mins to allow flavours to mingle. Top with a dollop of yoghurt and enjoy. When I was a child this was a salad that was always on my grandmother's table - served in a pretty cut glass oval dish. It is great to be able to re-create food memories. I am sorry to hear of Angelica's passing. My condolences to Hanno, you and all of the family. Sad news about Hanno's sister. Oddly my husband and I visited Hamburg 2 years ago and loved it. I bought a skirt in Wedel and we visited the really old town nearby whose name escapes me at the moment. Glen has a cousin in Germany and Hamburg is one of her favourite holiday destinations. Oh Rhonda, I'm so sorry to hear of the loss of Hanno's sister. I must be a comfort to him to spend time with Jamie at a time like this. 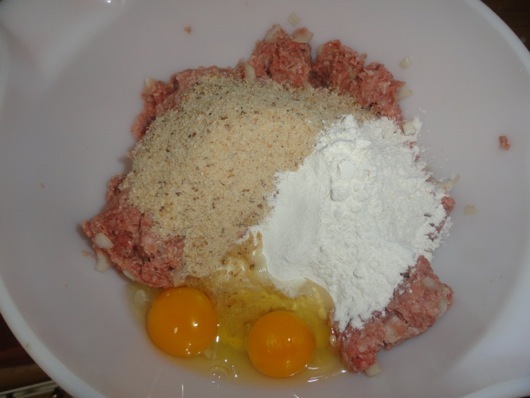 (I've always loved your grandson's name, my son's name is Jamie also) My meatballs are always different, eyeballing ingredient amounts but they always contain bread crumbs, egg, a splash of milk and a tiny squirt of mustard for kick. The seasonings will be adjusted based on what I will do with them - Italian seasonings to pair with pasta, or just salt and pepper if they're going into BBQ sauce, or maybe thyme if they'll be served with a brown gravy. Your recipe looks very similar to mine. Now I'm in the mood for meatballs! Hi Rhonda - I am very sorry to hear the your sad news. As others have said keep those beautiful memories of Angelica close. Your dinner looks and sounds delicious, it will be a guaranteed entry on my Monthly Menu for May, thank you for sharing. It is lovely that you get to spend precious time with your family and grandchildren. Dear Rhonda and Hanno, so sorry to hear about the passing of your sister and sister in law, it's a very sad time for you both. The meal looks delicious, I'd like to give this a try. I made bread in my bread machine yesterday using the instructions from a post on your site. I had not used my break maker for a very long time (at least 10 years!) as I'd previously used mixes and found the bread very heavy. This time the bread was absolutely delicious - I'm so glad I gave it another try. In all of the decluttering I've done over the years, for some reason I always held on to the bread maker - maybe I knew one day I'd give it another go, and make some delicious bread. Yay! My condolences to your family. It's especially difficult being far away from family. Your dinner looks delicious - I'll have to try the pickled cucumber salad this summer. Very sorry to hear of the loss of Hanno's sister. Our thoughts are with you during this difficult time. I don't have a favourite meatball recipe per say but do love throwing a few meatballs into a soup to 'beef it up', especially if my husband is craving meat. The River Cottage cookbook has a recipe for chorizo mix that I've been meaning to try. It's not in sausage skin so you can make it into meatballs very easily. That would really spice up a dish! So sorry for the loss of Hanno's sister. Our condolences to dear Hanno on his sad news. We also saw the Food Safari episode and loved it. My mother who is from NE of Hamburg was quite excited to see the similarities to her home's menus. It is great to see the producers are now showcasing some of the lesser known cuisines like Danish, Maltese etc. Once again, our best wishes to you both. Sending my condolences to Hanno for his very sad news. So very sorry to hear about the loss of Hanno's sister. 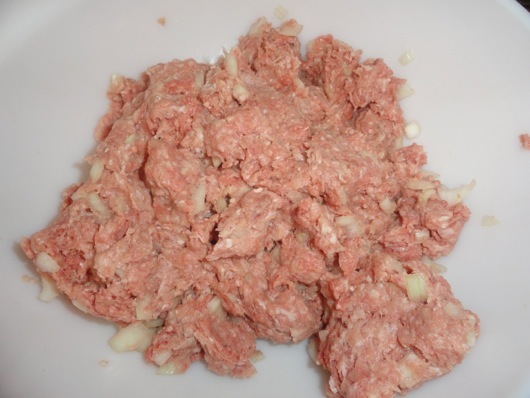 My Grandmother came to America from Belgium and my family has always made frickadellas(not really sure of the correct spelling)for holidays and family gatherings.We make them very similar to your recipe,a few different ingredients.We roll meat into balls,then boil till almost cooked through,then fried in butter. I'm so sorry of the passing of Angelica. Big hugs to you and the family. Hold those precious memories close to your hearts. my loving thoughts are with Hanno and you Rhonda, on the sad passing of Angelica, hold your memories and love close in your hearts. Enjoy the day with Jamie, grandies are wonderful. Rhonda - my condolences to your family. The nicest thing anyone said at my aunt's passing, "she is not gone, so long as one remains who remembers"
So sorry to hear about Angelica. It's always sad when you lose someone close. Thank you for the recipes. My condolences to Hanno & family at the loss of your much loved sister. It must be difficult being so far away. Dinner looks nourishing, delicious & simple.... although we're not fans of cucumber, I'm sure I could try zucchini instead. Hi Rhonda, I'm very sorry to hear about the loss of your Sister in-law and Hanno's sister, I am sure she will be greatly missed. What a pleasant surprise I had on the weekend, whilst also grieving the loss of a loved one, (our beloved Grandfather) to see your face in the Sunday Herald Sun 'Body & Soul' magazine. It's great to see the simple living movement in mainstream media. Hopefully a lot of people were reached. I'm very sorry Hanno lost his sister - no matter how old you are, a sudden death is a shock. We'll remember him in our prayers. I'm so sorry to read of your loss, Bec. Take care. Hi I was sorry to read about the sudden death in your family. Initially it is hard to just get over the shock of hearing that bad news and then you have to face the grieving. Its a hard time for any family to go through. It is lovely that you look to your other family as distraction from the tough times and making many more wonderful memories with you. Your meatballs look good. When I used to make meatballs I never added milk. So maybe they would have been better with it. I dont make them now as I cant tolerate any oil. 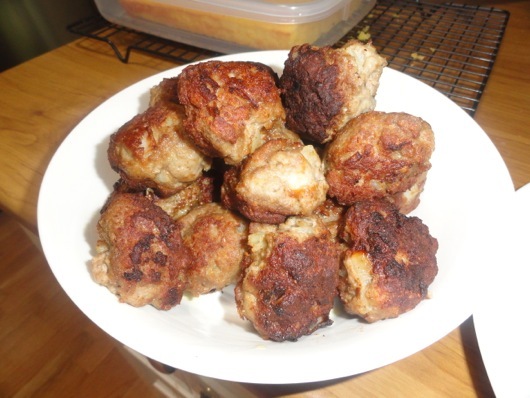 My husbands mother used to use weetbix as a binder in her meatball recipe. Such sad news. To have loved ones around at these sad times is so comforting. Jamie would certainly have helped in that department I'm sure. Rhonda, I am also sorry to hear about Hanno losing his sister. I have lost a sibling and I felt like I had a part of me missing for some time. It is a sad time. Thank you for the yummy looking recipe. I will try that out soon. I am very sorry to hear about your loss Hanno and Rhonda. May the wonderful memories help sustain you through the pain of loss and carry you. Sincere condolences to Hanno and your family. I lost my brother in February, so I can relate to how you are feeling about now. It is never easy letting go, no matter the distance. Thank you for sharing all the recipes. I will certainly try them. I would like to save even more in our home. So sad to read about your brother, Annie. Deep sympathy for the loss of Hanno's sister. I'm sure the meal and Jamie were a balm for his heart. So sorry for your loss Hanno and Rhonda. Must be hard for Hanno not living close to be able to be by her side. Nice that he has little Jamie to cheer him up. 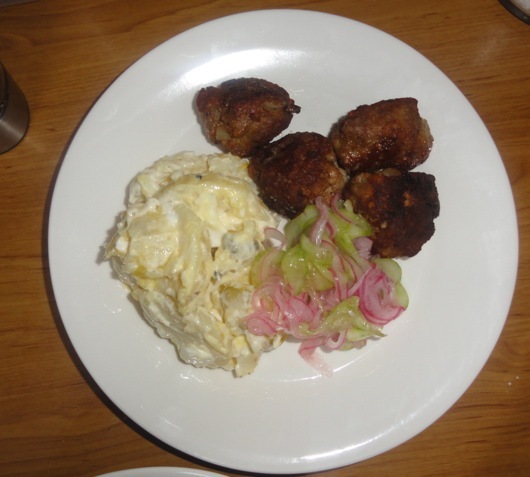 Those meatballs are exactly what we are having tonight, with mashed potato - I think of them as Danish rissoles because I was shown how to make them by a Danish friend years ago - now I know they are traditional I understand why my Danish grandfather (Dad's father) always asked for them when he came to stay but wasn't happy with my mother's more english version that included tomato sauce and always with cabbage. Thanks for helping me to understand that. Losing a relative overseas is always difficult and illustrates the need for regular contact before it is too late. I have been through it too and you always feel a little left out of the shared grief, memories and family togetherness. Sad times for your family Rhonda and Hanno. I pray that all the happy memories come forth for you as you mourn the loss of your dear sister. My thoughts and prayers are with you. Thank you for the recipe Rhonda, I'll be trying that one and great hint about poaching the eggs, I had never thought of that. Hanno and Rhonda I am so sad that Angelica passed so suddenly. My only sibling lived far from me and I saw him rarely. He died suddenly and it was difficult indeed. Please take care of one another and love to you both at this sad time. So sorry for your loss, my thoughts and prayers are with you both. Happy for you that your family is so close by, nothing like spending time with your grandchildren to sooth the soul. Thanks for the recipe but I could not figure out where the poached egg came in-mixed into the potato? Our condolences to you both for the loss of Angelica. Does Jamie know what role he is playing for Hanno? 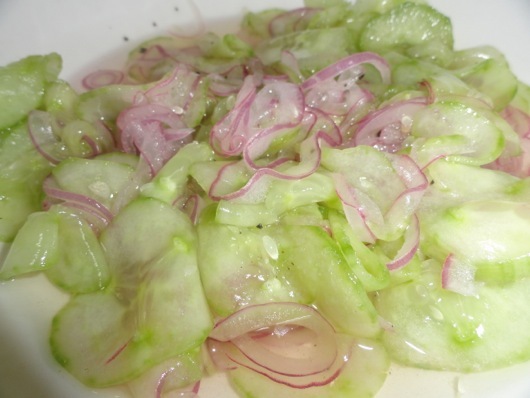 We make a similar "pickled" cucumber salad, but without the salt, simply slicing the cukes and onions and putting them in the vinegar/water/sugar mix. It is best if it can stand for a while before eating, but if not, it is still fine, and leftovers are also. We often add some dill seed or dill (green parts) or chopped parsley as well. If anyone is concerned about the salt content, this is one solution. The cukes and onions are of course much crisper this way. My condolences on losing your sister-in-law. It sounds like things were a bit easier over the weekend having your immediate family visiting and being able to enjoy them in your time of grief. Your menu sounds lovely - I will bookmark this & try it very soon. My favourite meatball recipe ever is BBQ meatballs - a favourite from a very old Woman's Weekly recipe book from the 1980s which I still have! Losing a sibling has to have its own kind of pain and sorrow. Sending a big hug to Hanno and you. What a sweet and comforting meal you made. My condolances to you both. p.s. I do my meatballs just like this but with basil added. So sorry about Hanno's sister. Take it slow this week and spend time remembering. I always find it interesting that so many things we remember about loved ones is the funny things and laughter. We all eneded up being quite silly at my MIL's funeral 4 years ago but she would have been smiling at all of the good times and laughter of remembering her that day. So sorry for your ad Hanno's loss, Rhonda. May your memories help heal your pain over time. Deepest sympathies to Hanno and you for your loss. Glad family is close by to help get through the sad moments. I'm so sorry for your loss Hanno and Rhonda. It must be extra difficult as you're so far away from your European family. I'm thinking of you both. So sorry for your loss, Rhonda and Hanno. Sending prayers and happier thoughts. I am so very sorry for your loss. Mein herzlichstes Beileid, Hanno. So sorry to hear of this news. My thoughts go with you and your family at this time.